State of GGWash: A lot has been changing behind the scenes. Can we be sustainable for the future? Back of computer monitor stock photo from Tatiana Popova/Shutterstock. 2018 has been a year of change for GGWash. Most of it isn't stuff you can see as readers; the blog looks the same, and thanks to the terrific work of our Managing Editor Julie Strupp, it's doing great. Everything else has been changing, meanwhile. Our main funding source for the last few years is expiring, and we're working to build up new revenue sources like our Neighborhood membership program, advertising on the blog, and events with sponsors. We're building on our successful coalition work with DC Sustainable Transportation to grow and expand our advocacy. And, we want to strengthen our connection to all of you, through online and offline means that ensure the staff work on the issues that matter to our community. I founded the blog in 2008, and it started out entirely as a volunteer project. Let's call this the first GGWash organizational generation. In 2013 we started doing a reader drive to raise some funds for a part-time editor, since I couldn't keep editing all of the content especially with the birth of my daughter that year. Around that time, volunteer leaders of what ultimately became our Editorial Board started talking about how to make GGWash a real, sustainable, lasting organization. Should we be a media company? A nonprofit? An organization with real employees? Just a volunteer effort? We decided to become a nonprofit and pursue having a real budget and staff, and incorporated as a nonprofit. To keep the blog going sustainably, we felt, would require at least two full-time staff: an editor and someone to manage the organization, raise funds, and handle all the administrative tasks inherent to operating an incorporated entity. Fortunately, shortly thereafter, we got connected with the Open Philanthropy Project, a foundation funded by some Facebook co-founders which was interested in land use reform as an issue. Open Phil funded us to grow to three people and start doing direct advocacy work on housing, particularly the (then-)upcoming DC Comprehensive Plan revision. We hired Sarah Guidi as Managing Director in early 2016 to be the manager and administrator, made our then-editor Jonathan Neeley full time, and also hired David Whitehead for the housing work. Julie Strupp replaced Jonathan as editor in 2017. This team, generation two, has done an amazing job. Sarah established us as a professional organization with a good workplace culture and procedures. David built a coalition around more housing, affordable housing, and protections against displacement the Comp Plan and built our online advocacy to weigh in on issues from Reston density to TheBus in Prince George's to RFK and historic districts in DC and much more. And Julie has grown the blog traffic by 11% for 2018 versus 2017 while also broadening our coverage and authors to have more about Maryland, Virginia, the environment, buses, and equity. With support from Island Press, we created a fellowship for two journalists to write about urbanism issues. We grew the Board of Directors and set up three strong volunteer program committees: our existing Editorial Board guides and makes decisions about blog content; our Advocacy Committee advises and decides on advocacy campaigns like action posts and emails; and our Elections Committee sets political coverage and makes election endorsements. However, we still aren't yet up to financial sustainability, because our biggest grant is ending. We knew going in that Open Phil might not keep funding in this area long term, and indeed they have focused more on other priorities like criminal justice, factory farming, and making sure AIs don't kill all humans (worthy goals for sure). They renewed us (at a lower amount) in 2017 even despite this focus, but have told us to assume that Open Phil won't be supporting land use work in DC after our grant expires in mid-2019. We're now working to build new sources of revenue tied more directly to this blog. We hired Jane Green as Development Director, and she's launched the GGWash Neighborhood, a membership program designed around building an ongoing relationship with readers who get to support the blog and also receive special benefits. We've added advertising to the site. And we've started organizing more in-person events for members and paying non-members to engage more deeply in issues and which supportive corporate entities can also sponsor. As we get new members, get other donations, sign orders for ads, or book event sponsors, the appropriate category grows in the chart. 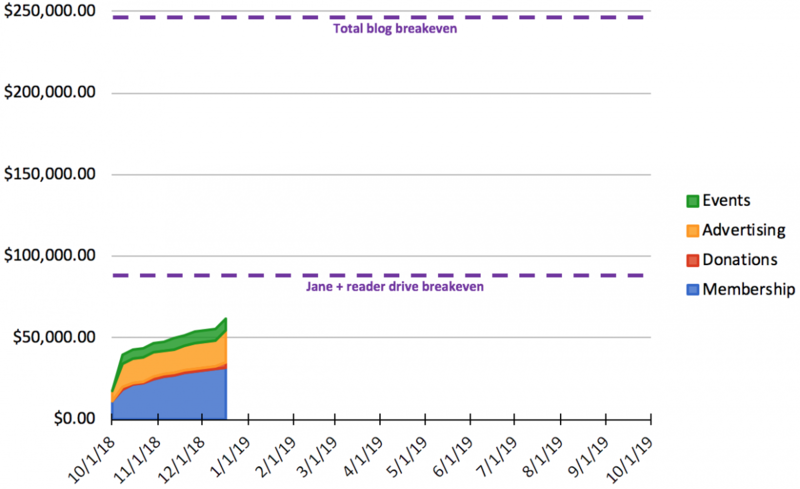 If we can hit the first dashed line before the end of 12 months, we've raised at least as much as we used to with our reader drive and covered the added staff cost for Jane. If we can reach the top dashed line, we've fully covered the blog and made it a self-sustaining operation. Once we hit October 1, 2019, the chart starts over in a sense. We need to renew Neighbors we have, put on new events, and pay for another year of expenses. Hopefully, even if we don't hit the top dashed line this year, we at least pass the bottom one and build a base which we can work from the next year. We'll have a new team for this new effort. Sarah moved to Raleigh in October, and I've been taking over most of the day to day and strategic management for the organization. David Whitehead will be leaving mid-January to organize in education, a field near and dear to him since he is a former teacher. Julie, Jane, and I are now joined by two new people, Yancey Burns and Caitlin Rogger. They will write more detailed posts introducing themselves soon! Among other things, they will take over our online and offline advocacy, like our work on the Comp Plan, our digital issue campaigns, our work with Advisory Neighborhood Commissioners, and 2018 election coverage and endorsements. It's likely that generation three will also focus more heavily on our coalitions. In 2017, GGWash teamed up with an existing nonprofit called DC Surface Transit, which at the time was primarily a venue for the Business Improvement Districts in DC and Rosslyn to advise DDOT and WMATA about the Circulator. The DCST board wanted to broaden the organization's focus, so GGWash became the manager. DCST began focusing on advocating for a network of bus priority corridors including bus lanes; better uses of curbside space such as pick-up/drop-off zones, truck or tour bus loading, bike parking, and parklets; and emerging technology like autonomous vehicles (farther future) or dockless bikes and scooters (now). We're looking to grow DCST and also establish some new coalitions on other topics like land use. Stay tuned for more on this as well. As we grow coalitions, however, we want to always keep in touch with what matters to our community. We are doing that by blogging about issues and hearing your feedback; by putting thumbs-up buttons or action buttons on posts and looking at how many people take action; and by always coordinating with our volunteer committees, particularly the Advocacy Committee, which has the final say over advocacy positions and campaigns. Of course, keep enjoying the blog, which we plan to continue to keep being great and being even greater when possible. In this third generation, we hope the new GGWash structure will be more sustainable, more effective on our issues, and will allow us to build a larger and stronger community of people who care about urbanism around the Washington region. And if you're not a member of the Neighborhood, can you join today to give us a strong start to 2019?